Israeli Prime Minister Benjamin Netanyahu will work with U.S. President-elect Donald Trump on solutions to the Iran nuclear deal which the Israeli leader insists paves Iran’s path to nuclear weapons. 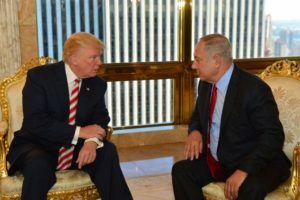 Trump has invited Netanyahu to the Oval Office at the earliest opportunity – a meeting for which the prime minister said he is already preparing. “We have to stop Iran’s march to the bomb, development of long-range ballistic missiles and support for terrorism around the world,” said Netanyahu. “Israel is committed – and when I say we’re committed, we’re committed,” he said, answering a question on whether he would ever take military action against Iran’s nuclear facilities. When questioned about an American movement the elite U.S. media call the alt-right, Netanyahu turned his focus to a movement to boycott, divest and sanction Israel as a hypocritical and antisemitic effort on the far Left.